The Los Angeles Dollarpoint company's mini-ringtop for ladies in their Artpoint model measures just 4 inches. Otherwise it is very similar to the full-sized Artpoint pencils with clips; both were made made in the early 1920s. 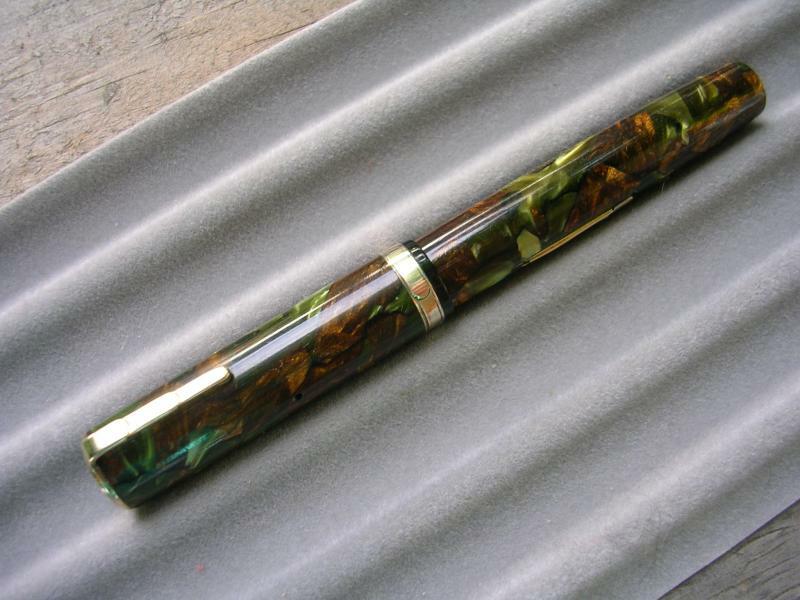 The greeny-bronze patina shows the pencil is brass. A lot of design in a small package. If you had any doubt that the petite Lady Patricia pencil (and pen, of course) was meant for women, you have only to see this ad: "The Lady Patricia-- A fountain pen inspired by women, for women. It takes more than a 'scaled-down' size, a ring and a ribbon to make a fountain pen that women really like." In the ad you can see the pen and pencil sets in the Persian, Jet, and Onyx colors. Recently I added the Moss Agate color pencil to my group of Lady Ps. The marble is green pearl and a glittery bronze with black veins and solid black point section. Its clip, tip, and band are gold-toned. The imprint is on the back of the cap, which screws off to allow access to the eraser. It uses 1.1 mm lead, and as the ad mentions, is 4 & 1/4 inches. According to the ad, every Waterman's is "guaranteed forever," but if they did go wrong, "service stations" were maintained for repair. The pen, photo courtesy of the Fountain Pen Network, is below. Yet another family Sheaffer pencil came to light recently, my dad's black and silver Skripsert which accompanied the Skripsert pen. 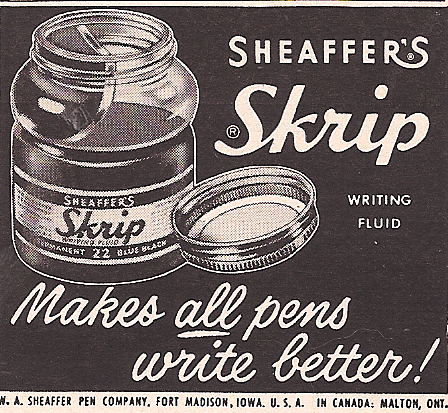 Skrip was the brand name of Sheaffer ink, coyly called "writing fluid" by Sheaffer. If this bottle doesn't look familiar, you're probably too young to remember fountain pens, too. The bottle had a shallow well in the glass at the top for the easier filling of your pen. Ink came in different colors, and in permanent or (allegedly) washable. 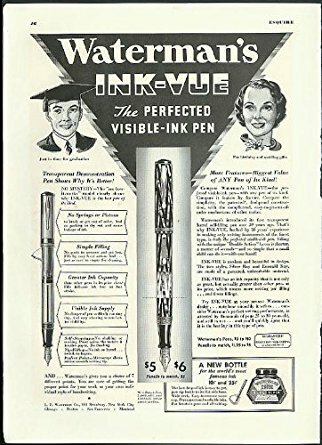 The Skripsert pen was, I believe, Sheaffer's first pen filled by an ink cartridge. Oh, joy! No open bottle of ink! Nothing to spill, nothing to fill. You just take apart the pen, slide the empty ink cartridge out, and pop a new one in, with no ink anywhere near your hands or furniture. This is how virtually all modern fountain pens and technical pens are filled. Skripsert was the name Sheaffer gave the pen that could have the Skrip inSerted into the pen via a cartridge. It was mid-century advertising ploy, cutesie brand names made of combined words. 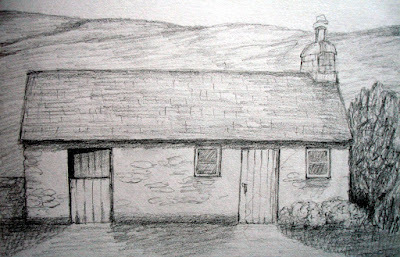 And here is the matching pencil. It's a smaller twist pencil at 4 & 5/8 inches. It uses the thinner 0.9 mm lead. 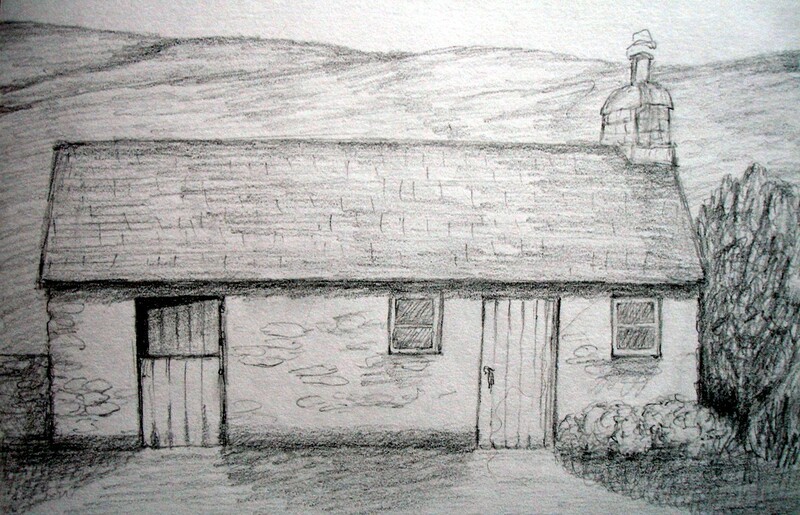 You can't quite see the blue eraser -- it's worn down to a nub. 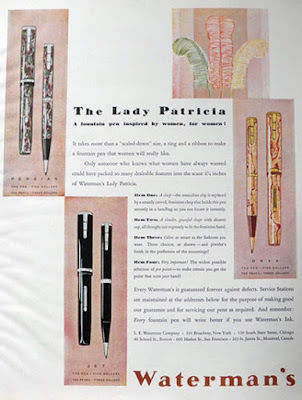 The Depression-era petite 4 & 1/4 inch pencil called the Lady Patricia (companion to the pen of the same name) was re-designed when Waterman's created their new "Ink-Vue" pen, with a transparent barrel section, so you could view the ink, of course, in order to know when you were running low. The Lady Patricia pencil acquired a new clip and center band, and was even smaller than before, at 4 & 1/8 inches. Two colors of marble were available at first, "Sunset," a red, and "Mist," a green-grey, with a color-matched section of Bakelite in the point. Also, "Black Lace" was offered--a solid black. Here is my newly acquired "Mist" version. The clip has a diamond pattern, as does the center band. The imprint is on the back of the cap, which screws off to reveal the eraser. This is the Sunset color Lady Patricia Ink Vue pen. And here are my other Lady Patricia pencils, in the onyx (right), and jet colors.